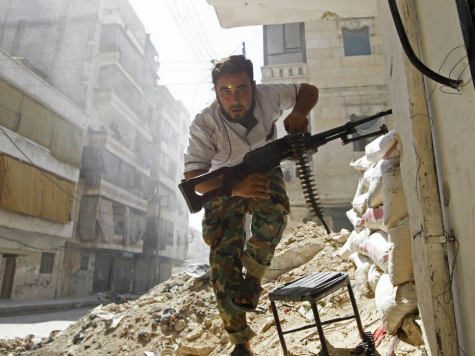 With a Strategy Like This, Does it Even Matter Who the Free Syrian Army Is? Assume for a moment that the Free Syrian Army, the mysterious rebel alliance to which the United States is now allied in its broader campaign to degrade and destroy ISIS, is not the ill defined and ever-changing conglomeration of tribal factions; each committed to a Jihadist agenda in some degree and each with their own mysterious allegiances actively seeking the military overthrow of the Iranian backed regime of Bashir al-Assad. Instead, assume that the FSA consists in fact of unimpeachably “vetted” limited government, Jeffersonian style democrats each of whom are are fully committed to the establishment of a US- styled constitutional republic in Syria, and thus utterly worthy of complete and total American support. Now that an air tight hypothetical premise has been built to justify bipartisan support for the FSA, try to imagine the Obama Administration authoring the policy most likely to condemn the FSA to certain defeat and US regional standing to rock bottom. One need not imagine however, that the latter part of the fanciful scenario spelled out above is in any way fictional. As it currently has been articulated, this pretty much sums up US policy vis-a-vis the Free Syrian. As of this writing, Syria’s civil has been raging for 1294 days. During that span, more than 200,000 Syrians have been killed, many times that wounded and more than one third of the country’s 30 million people have been made homeless. The country’s map now resembles a pockmarked incomprehensible hodgepodge of regime and rebel redoubts and strongholds massed against each other. The two main sides in Syria’s civil war–the regime and its prime opponents who collectively chooses to call itself the Syrian Coalition–have fought each other to a standoff in the past several months. The ISIS forces that occupy much of Syria’s east and north have largely avoided much military contact with regime forces, concentrating instead on consolidating its hold over the territory it controls, although ISIS forces did attack and overrun four Syrian military outposts in August, gleefully displaying the heads of Syrian soldiers its fighters had proudly cut off. Using US supplied war material it stole from fleeing Iraqi forces it overran in June and July, ISIS has fortified its positions in Syria and is rapidly moving toward Aleppo, Syria’s largest city currently in rebel or FSA, hands. The so-called “Free Syrian rebels” now find themselves confronted with an overwhelming multi forced front. In Aleppo, they are surrounded. Its continued control of that city depends upon it being able to hold communications lines that grow more precarious by the day. The Obama Administration and most western analysts estimate the size of the Free Syrian Army now caught in this deadly pincer at roughly 5,000 men. To the north and east, the 5,000 FSA fighters, if they can even be called a single force with unitary command, (There are at least three people at present who claim to lead the FSA). They face a rapidly expanding and ever emboldened ISIS army of between 10,000 and 31,500. Surrounding the 5,000 FSA fighter to their south and west are the regular forces of the Syrian Army that number between 130,000 to 165,000 men. The US strategy as announced by President Obama in his speech to the nation on September 10, 2014, calls for the US to establish staging areas inside Saudi Arabia where 5,000 FSA fighters can spend 18 months training to become a more effective and well armed fighting force to better combat both the Syrian regime, again numbered at up to 175,000 men and forces of the ISIS terrorist army. How will these 5,000 fighters leave their current positions and get to Saudi Arabia? Who will assume control of the positions they currently hold once they abandon them for the Elysian fields of Saudi Arabia? Once “trained” and “equipped”, how, a year and a half from now, will these 5000 FSA fighters, currently outnumbered 50 to 1, be able to “reassume” their long abandoned positions? Does the Administration and other supporters of its FSA assistance strategy expect ISIS and Assad forces to politely agree to hold their enemies coats while they excuse themselves for training in Saudi Arabia? Has there ever in American military history been a more hair-brained, ill-conceived military mission more certain to fail? Again, putting aside entirely the many valid questions about precisely who we are the people we are planning to train and what their real objectives are, with a strategy like this, does it really even matter?